This article introduces four UNESCO World Heritage Sites in western Japan: the A-Bomb Dome in Hiromashima, Kiyomizu-dera in Kyoto, monuments of the Ryukyu Kingdom in Okinawa and Himeji Castle in Hyogo Prefecture. When people go on trips, they often want to check out the World Heritage Sites of that country or area. We have carefully selected four registered World Heritage Sites located in western Japan that we would like to introduce to you in this article. The Genbaku Dome or A-Bomb Dome, a structure intended to convey the calamitous nature of nuclear weapons, was registered as a World Heritage Site in 1996. Before the Second World War, the A-Bomb Dome was the Hiroshima Prefectural Hall for the Encouragement of Industry. When the bombs were dropped on Hiroshima in 1945, the blast detonated vertically above this building, so its structure was miraculously spared from destruction. After the end of the Second World War, the dome at the top of the Hiroshima Prefectural Hall for the Encouragement of Industry came to be known by the city residents as the Genbaku Dome. The A-Bomb Dome is encircled by a fence, and ordinary visitors are barred from entry, but it can be seen at any time from outside the fence. To get to the Genbaku Dome from Tokyo, you can go either by plane or by shinkansen (bullet train). If you go by plane, travel from Haneda Airport to Hiroshima Airport, then take the Limousine Bus from the airport bound for Hiroshima Station. Get off at the Hiroshima Bus Center. It takes up to three hours to arrive at the A-Bomb Dome from Haneda Airport. If you go by shinkansen, get off at Hiroshima Station and switch to the city bus or streetcar. It takes up to five hours to arrive at the A-Bomb Dome from Tokyo Station. With regard to World Heritage Sites in Kyoto, the 17 cultural assets located in Kyoto City, in Uji (Kyoto Prefecture), and in Otsu City in Shiga Prefecture, are collectively registered as one Cultural Heritage Site under the official name The Cultural Assets of Kyoto, the Former Capital (Kyoto, Uji and Otsu). Incidentally, in an article published in the July 2014 edition of TRAVEL+LEISURE, a major American travel magazine, Kyoto was first on the list of “The World Cities You Most Want To Visit,” marking the first time ever that a Japanese city topped the magazine’s rankings. 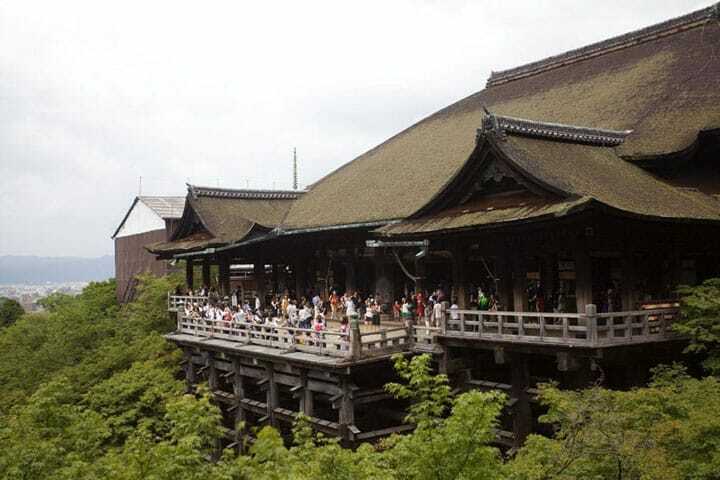 The registered cultural assets include Kiyomizu-dera, known for the sight of its beautiful fall foliage, Byōdōin-Hōō-dō, which is etched on the 10-yen coin, and Enryakuji, which has a history more than 1200 years old, among others. The shinkansen is a convenient way to reach Kyoto from Tokyo. It takes roughly two and a half hours to travel from Tokyo Station to Kyoto Station. The Kingdom of Ryūkyū, the former name of Okinawa, Japan’s southernmost prefecture, existed as an independent country from the early 15th century up until the late 19th century. Ryūkyū engaged in trade with China, Korea, Japan and various South Asian countries, and because of this, its own culture mixed with those of foreign countries. This led to the formation of Ryūkyū’s totally unique culture, and the Gusuku fortresses, which are World Heritage Sites, are striking cultural representations. Officially, they are registered under the name Gusuku Related Heritage Site Ensemble of the Ryūkyū Kingdom. Of these sites, the Shuri-jō Ruins, pictured at the start of this section, are particularly impressive. You can see how different Shuri-jō is from castles that exist in other regions of Japan. Going by plane is the fastest way to get to Okinawa from other parts of Japan, and it takes up to three and a half hours to arrive. Himeji Castle was registered as one of Japan’s first World Heritage Sites. Due to the castle’s magnificent white walls and the imposing figure it cuts by towering above its surroundings, it is also known as Shirasagi-jō, or the White Egret Castle. Himeji Castle was constructed in 1609 and occupies a place in the highest echelon of wooden buildings built in Japan. It is valued for the fact that 400 years after the castle’s construction, the watchtower, the gates, the packed mud walls and other castle structures made from dirt and wood are currently still in satisfactory condition. From the top floor of the castle, you can see the entire Himeji Castle and the neighborhoods of Himeji. You can also get a good view of the roof tiles of the castle, and really understand their beauty. To get to Himeji from Tokyo, going by shinkansen is the best way. Get off at Himeji Station, then walk from there. Alternatively, take the Shinki Bus and get off at Ōtemon-mae. It takes approximately three and a half hours. What do you think? These Heritage Sites are a bit far from Tokyo, but they are all very worth your time. By all means, go west and see what Western Japan has to offer.